For many years, the need for housing that responds to the unique needs of military veterans in Orange County has been unmet, especially for those veterans who are homeless and struggling to survive on the streets. Jamboree is a part of the solution. Our goal is to provide the largest Permanent Supportive Housing development for veterans in Orange County. 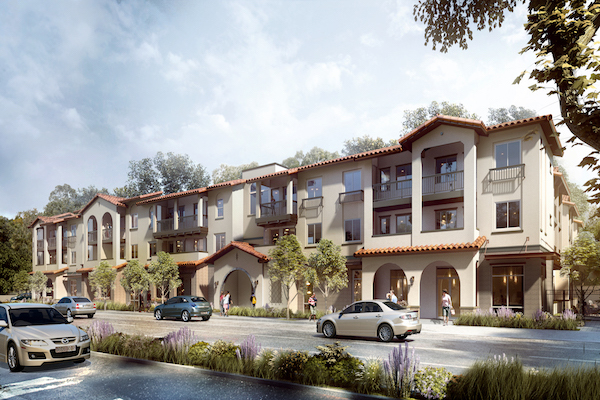 With the assistance of like-minded corporate and humanitarian partners, construction on our Spanish revival-style Santa Ana Veterans Village is now under way. This three-story, 75-unit supportive housing development is thoughtfully planned, down to the inclusion of a peaceful courtyard and community garden for residents to enjoy. Santa Ana Veterans Village is a unique solution to modern veterans housing, where formerly homeless veterans and their families can find not just housing but also the assistance they need to move forward in their lives in a healthy, productive manner – all in one place. Next year, when families move into Veterans Village, they will have immediate access to critical onsite supportive services, including employment assessment, training and job placement as well as much-needed mental health services. Addressing housing needs for veterans has broad support and interest. 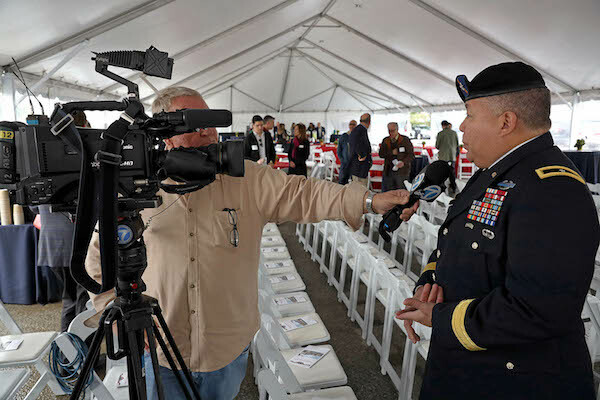 Already being called a “sanctuary of stability and hub of hope” by media – such as the Orange County Register and ABC7 – the development of Santa Ana Veterans Village has the full support of city, county and community leaders. Why is this story captivating southern California and beyond? The services offered at Santa Ana Veterans Village aren’t just open to residents of the housing development; these services are available to ALL veterans in Orange County! Check out the Top 10 FAQs about Santa Ana Veterans Village below for a list of our supportive services. Based on the Homelessness in Orange County: The Costs to Our Community study conducted by UC Irvine and funded by Jamboree and United Way Orange County, Santa Ana Veterans Village has the potential to save Orange County more than $3.9 million in emergency services, unnecessary hospitalizations and other expenses annually by providing 75 homeless veterans with housing and services. Since the release of this study, the County of Orange has adopted a plan and committed to fund construction of 2,700 supportive housing units over the next three to five years, which would end chronic homelessness in Orange County. The involvement of several standout individuals, leading veterans services partner organizations and national corporations like The Home Depot Foundation further underscore the importance of veterans housing with services. Santa Ana Veterans Village would not be possible without the support of all our committed financial and community partners. Read more about them in the Top 10 FAQs about Santa Ana Veterans Village below. At Jamboree’s groundbreaking ceremony for Santa Ana Veterans Village on January 7, 2019, a number of veterans came to help celebrate construction of new Permanent Supportive Housing for homeless veterans and their families. Among them was the Honorable Judge David O. Carter of the U.S. District Court. We were pleased to have this decorated Vietnam combat veteran deliver a message of inspiration from the podium. Who better would understand the needs of the brave men and women who often find it difficult to ask for the help they need than a fellow veteran? Along with all of our partners, Jamboree is excited about this project and its progress. Follow us on Facebook so you can watch as the project moves forward. Go to Jamboree’s Facebook page now! Who is talking about Santa Ana Veterans Village? 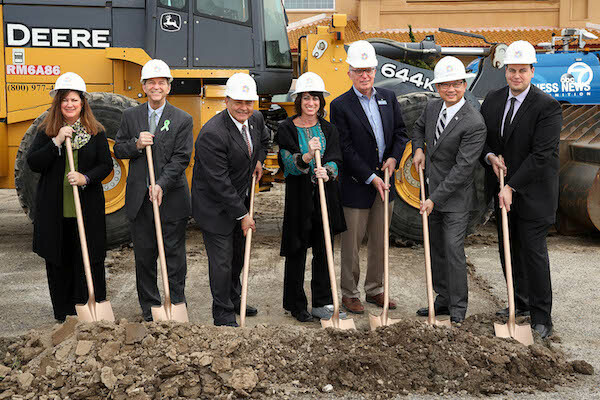 The groundbreaking has also garnered local mainstream media coverage by NBC Los Angeles, 89.3KPCC, Spectrum 1 News and the Los Angeles Times – as well as national headlines in building publications like Multi-Housing News and Affordable Housing Finance. If you’re a citizen who wants to help make a difference in your community, find out how to suggest solutions that work to help end homelessness. If you’re ready to join the conversation as an elected official, city staff, a leader of a faith-based organization, community organization or other nonprofit, find out how to create more solutions to help end homelessness. Where is Santa Ana Veterans Village located and when does it open? Located at 3312 W. First Street between Harbor Boulevard and Fairview Avenue, Santa Ana Veterans Village is less than three blocks from bus service line 64 and less than one mile from Cesar Chavez Campesino Park and a shopping center. Construction has officially begun and is slated for completion by early 2020. How big is the property and how many housing units are available? This veteran-centric supportive housing development is situated on a 1.5-acre lot that was once a service station and, most recently, an open parking lot. A total of 75 housing units will be available to formerly homeless veterans and their families – including 71 one-bedroom and four two-bedroom apartment homes. What else does the community offer to residents? Santa Ana Veterans Village is more than a place for residents to lay their heads. In collaboration with the City of Santa Ana, the County of Orange, the Veterans Administration (VA) and other leading veterans services organizations, designs by Architecture Design Collaborative, Jamboree’s architectural partner on the project, include a U-shaped three-story residential building that opens onto a spacious courtyard and a 4,500-square-foot community center that will be home to a veterans services collaborative and includes a fitness center and yoga room, counseling offices, and multipurpose rooms. Furnished apartments feature full kitchens with up-to-date appliances, a full bath, closet and storage areas, and private balconies. Other property amenities include an elevator, a community kitchen and conveniently located central laundry facility. Plus, Santa Ana Veterans Village offers 10,000 square feet of open space featuring a tranquil courtyard and a community garden, a quiet sitting area with a reflection garden and a fire pit, a basketball half-court as well as an ample number of barbecue grills and picnic tables. A dog run and spa are also planned. Does the building conform to Americans with Disabilities Act (ADA) requirements? Yes, Santa Ana Veterans Village is designed to comply with Americans with Disabilities Act (ADA) requirements as well as achieve a Leadership in Energy and Environmental Design (LEED) for Homes Silver certification. How will veteran residents pay for their housing? All units are set to have Veterans Affairs Supportive Housing (VASH) vouchers with values of $1,580 for a one-bedroom and $1,994 for a two-bedroom unit. Residents will pay a portion of the rent, based on annually published HUD rents for income level and family size, paying an average of approximately $267.00 a month. What are the supportive services to help veterans thrive and why are they needed? Santa Ana Veterans Village will be a place where veterans – not just veteran residents, but ALL veterans in the Orange County area – will have onsite access to a variety of wrap-around services. The combination of these services and housing that define Permanent Supportive Housing help residents rebuild their lives after struggling with homelessness and other issues that many veterans face upon returning home where they have to re-acclimate into civilian home life. Step Up on Second, an experienced provider in working with people who have serious mental health issues and those who have been chronically homeless, will be the contracted service provider at Santa Ana Veterans Village. Step Up operates more than 250 Permanent Supportive Housing units throughout Southern California. Jamboree also is partnering with several other service providers: the VA Long Beach Healthcare System for mental health counseling and wellness services; Goodwill of Orange County’s Tierney Center for Veteran Services to provide employment services; Veterans Legal Institute for pro bono legal assistance; Strength in Support for individual and family therapy, mentoring and onsite workshops. Jamboree’s onsite Resident Service Coordinators will be a consistent presence that supplements the VA case managers. As a nonprofit, how does Jamboree fund and build such a large, well-supported community? The $29.7 million project is being financed with tax credits, loans and government funding as well as generous contributions from our partners. Nine public and private entities are funding this development, including the City of Santa Ana, the U.S. Department of Veterans Affairs, and the U.S. Department of Housing and Urban Development. Union Bank is providing $12.9 million in tax credit equity, a $23 million construction loan, and a $9.9 million permanent loan. Santa Ana Veterans Village is also receiving $1.5 million from the Orange County Community Foundation, $0.5 million from The Home Depot Foundation, and $2.9 million from the OC Health Care Agency. How many homeless veterans are there in Orange County? According to the 2015 U.S. Census, approximately 123,000 veterans live in Orange County, and in 2017, a survey of Orange County’s homeless population found that 12 percent of the homeless are veterans. Of those, about 400 are without shelter. If you are interested, please call 714-202-4900, the information line established for Santa Ana Veterans Village by our property management partner, The John Stewart Company. Orange County’s Coordinated Entry System (OC CES) facilitates leasing intake for Santa Ana Veterans Village. Priority placement is offered to chronically homeless veterans who are currently located in the service area. Information on how to get into OC’s CES to be considered for the Santa Ana Veterans Village project will be available in the fall of 2019. If you are a homeless veteran or a veteran at risk for homelessness and need assistance now, call 877-4AID-VET (877) 424-3838. If you need housing right now, call 211!